1988.06-1992.06 Research Associate, Prof. K. N. Houk at UCLA. 1981 B.S., Physical Chemistry, Lanzhou University, P.R.C. 11. Fukui Medal, The Asia-Pacific Association of Theoretical & Computational Chemists (APATCC) 2014. 12. Scientific Board, World Association of Theoretical and Computational Chemists (WATOC), 1999-. 13. Vice-President, Asian Pacific Association of Theoretical and Computational Chemistry (APATCC), 2012- . 14. International Editorial Advisory Boards of 12 Scientific Journals, including Journal of Computational Chemistry, Accounts of Chemical Research, National Science Review, Journal of Physical Chemistry, WIREs Computational Molecular Science. 15. 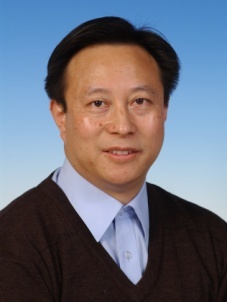 Achievement Award for Physical Organic Chemistry, The Chinese Chemical Society，2015. 16. Alexander-von-Humboldt Research Award, Alexander-von-Humboldt Foundation, 2016. 3. Drug design based on protein-protein interactions. 2. Wang, Y.; Hu, X.-J. ; Zou, X.-D.; Wu, X.-H.; Ye, Z.-Q. ; Wu, Y.-D. WDSPdb: A Database for WD40-repeat Proteins, Nucl. Acids. Res. 2015, 43, DOI: 10.1093/nar/gku1023. 3. Ding, S.; Song, L.-J. ; Wang, Y., Zhang, X.-H.; Chung, L. W.; Wu, Y.-D.; Sun, J.-W. Highly Regio- and Stereoselective Hydrosilylation of Internal Thioalkynes under Mild Conditions. Angew. Chem. Int. Ed. 2015, 54, 5632-5635. 4. Jiang, F.; Wu, Y.-D, Folding of Fourteen Small Proteins with a Residue-Specific Force Field and Replica-Exchange Molecular Dynamics. J. Am. Chem. Soc. 2014, 136, 9536-9539. 5. Yang, Y.-F.; Cheng, G.-J. ; Liu, P.; Leow, D.; Sun, T.-Y. ; Chen, P.; Zhang, X.; Yu, J.-Q. ; Wu, Y.-D.; Houk, K. N, Palladium-Catalyzed Meta-Selective C–H Bond Activation with a Nitrile-Containing Template: Computational Study on Mechanism and Origins of Selectivity. J. Am. Chem. Soc. 2014, 136, 344-355. 6. Cheng, G.-J. ; Yang, Y.-F.; Liu, P.; Chen, P.; Sun, T.-Y. ; Li, G.; Zhang, X.; Houk, K. N.; Yu, J.-Q. ; Wu, Y.-D, Role of N-Acyl Amino Acid Ligands in Pd(II)-Catalyzed Remote C–H Activation of Tethered Arenes. J. Am. Chem. Soc. 2014, 136, 894-897. 7. Jiang, F.; Zhou, C.-Y. ; Wu, Y.-D. Residue-Specific Force Field Based on the Protein Coil Library. RSFF1: Modification of OPLS-AA/L, J. Phys. Chem. B 2014, 118 (25), 6983–6998. 8. Ding, S.; Song, L. J.; Chung, L. W.; Zhang, X.-H.; Sun, J.-W.; Wu, Y.-D. Ligand-Controlled Remarkable Regio- and Stereodivergence in Intermolecular Hydrosilylation of Internal Alkynes: Experimental and Theoretical Studies, J. Am. Chem. Soc. 2013, 135, 13835-13842.